New Year’s is approaching, a time when millions of people will celebrate with food, new resolutions or a even kiss as the clock strikes 12. But how much do you know about the holiday? 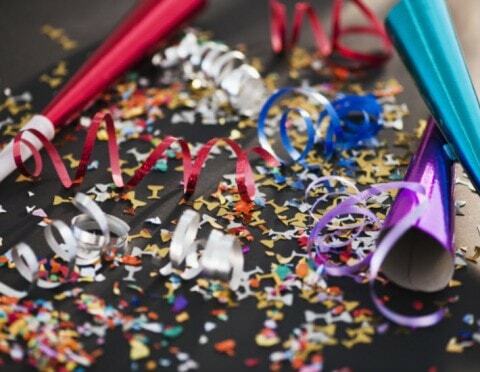 Here are 10 fun facts about New Year’s. The first New Year’s celebration dates back 4,000 years. Julius Caesar, the emperor of Rome, was the first to declare Jan. 1 a national holiday. He named the month after Janus, the Roman god of doors and gates. Janus had two faces, one looking forward and one looking back. Caesar felt that a month named after this god would be fitting. Forty-five percent of Americans make New Year’s resolutions. The top resolutions are: to lose weight, get organized, to spend less and save more, to stay fit and healthy, and to quit smoking. While nearly half of all Americans make resolutions, 25 percent of them give up on their resolutions by the second week of January. Be sure to eat leafy greens on New Year’s. Tradition says that the more leafy greens a person eats, the more prosperity he or she will experience (what an incentive for staying healthy!). Tradition also says that legumes bring prosperity because beans and peas look like coins. No wonder why so many people eat black eyed peas on Jan. 1. Many people ring in New Year’s by popping open a bottle of champagne. Americans drink close to 360 million glasses of sparkling wine during this time. The bubbly stuff dates back to the 17th century, when the cork was invented. About 1 million people gather in New York City’s Times Square to watch the ball drop. The Times Square New Year’s Eve ball drop came about because of a ban on fireworks. The first ball in 1907 was 700 pounds and was lit with 100 25-watt lights. The current ball puts the old one to shame (thanks to technology). Today, it is covered in 2,688 crystals, is lit by 32,000 LED lights, weighs 11,875 pounds and is 12 feet in diameter. Remember the last scene in When Harry Met Sally, when Harry references a song after he and Sally kiss? It wasAuld Lang Syne, a song traditionally sung at the end of New Year’s parties. Poet Robert Burns wrote it in 1788. Though most people do not know the words to Auld Lang Syne, the overall message is that people have to remember their loved ones, dead or alive, and keep them close in their hearts. If Santa is the most common symbol associated with Christmas, then Baby New Year is the symbol most commonly associated with….you guessed it, New Year’s! Baby New Year is often seen in a diaper, black top hat, and a sash showing the numbers of the new year. Myth states that he matures into an old man during the year. Make sure to be surrounded by family or loved ones on New Year’s Eve. The first person you come across in the new year could set the tone for the next 12 months. This applies to couples, as well. If a couple celebrating New Year’s together does not kiss, the future of the relationship might be splitsville, so be sure to lay one on your significant other. At the Mummers Parade in Philadelphia, 10,000 participants step through City Hall and perform in unique costumes. The parade dates back to mid-17th-century, incorporating elements from Irish, German, English, Swedish and other European heritages. The parade itself is divided into five divisions: a comic division, wench brigades, fancy division, string bands, and fancy bridges. If you are in the area for New Year’s, be sure to check out this event. According to statistics from the National Insurance Crime Bureau, vehicles are stolen on New Year’s Day more than any other holiday. Don’t think your old car is safe, either. In 2011, the 1994 Honda Accord was the most stolen car. To discourage car theft, make sure your car is in a populated area and always take your keys.